Self-produced in Austin, where Beth got more than a little help from her friends on drums and bass (Chris Smith), guitar (John Felty), and backing vocals (Bekki Frazier-Smith). 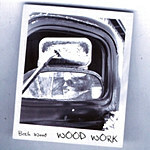 Folks who are looking for a mellow, pretty CD would like Woodwork. Also note that when scrambled it spells woodwork. You reduce the threat of rejection dramatically. So put away your dictionary and daydream.